The Queens 90th birthday is fast approaching! Oakfield will most certainly be jumping on board with the celebrations that will be taking place across the country on Thursday 9th June. Throughout the day all classes will be looking into the Royal Family, why it is important and moreover what influence the Queen has had throughout her reign. Lots of fun activities will be planned by all their class teachers. Here’s where the fun part begins! In the afternoon the WHOLE SCHOOL will join in with a tea-party. Children will sit together in the sunshine (we hope!) having finger sandwiches and scones in true British ‘afternoon-tea’ style with some music and games too. We are also asking that every child comes into school that day dressed in red, white or blue (Union Jack colours). It is a whole school non-uniform day. As you can appreciate, putting on a spectacular tea-party will come at a cost to the school. Therefore, we are asking for a £2 contribution towards the cost of the tea-party. 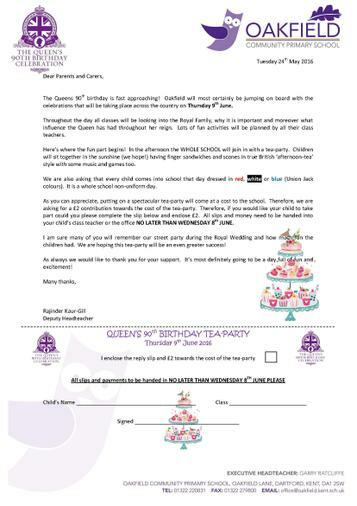 Therefore, if you would like your child to take part could you please complete the slip below and enclose £2. All slips and money need to be handed into your child’s class teacher or the office NO LATER THAN WEDNESDAY 8th JUNE. I am sure many of you will remember our street party during the Royal Wedding and how much fun the children had. We are hoping this tea-party will be an even greater success! As always we would like to thank you for your support. It’s most definitely going to be a day full of fun and excitement!